For those seeking adventure in Yellowstone National Park, Cooke City hotels and motels are near the northeast entrance. Some of the units have kitchenettes and fireplaces for added comfort. When making a reservation please be sure to remember to say you found them on gonorthwest.com. Alpine Motel. 105 Main Street, Cooke City, MT 59020. Phone: 406-838-2262; Toll-free: 1-888-838-1190. 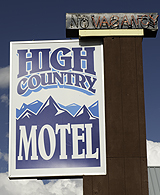 High Country Motel. US Highway 212, Cooke City, MT 59020. Phone: 406-838-2272. Hoosier's Motel. 114 Main Street, Cooke City, MT 59020. Phone: 406-838-2241. Soda Butte Lodge. 209 Highway 212, Cooke City, MT 59020. Phone: 406-838-2251.